Flew into Rome, Italy for one night. Doesn’t seem like it would be enough time, but it was. 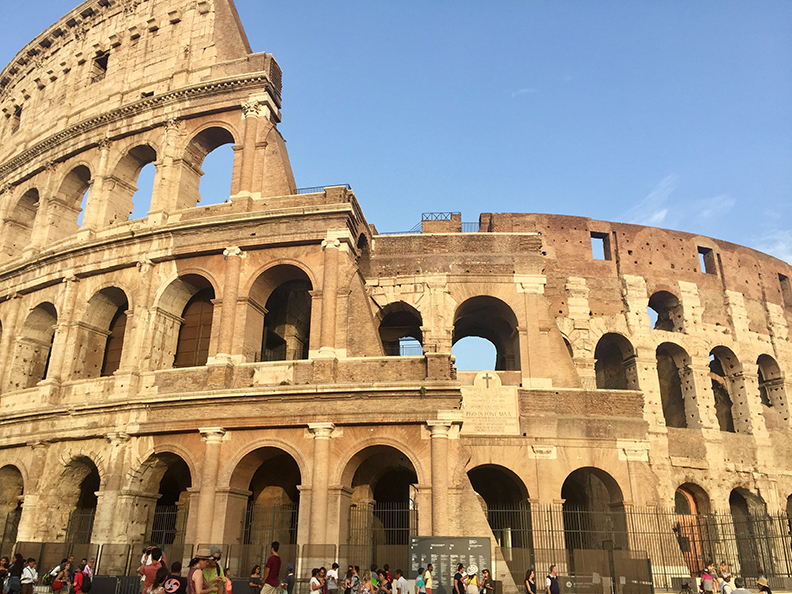 The first place I visited in Rome was the Colosseum, which is an oval amphitheatre in the centre of the city of Rome. It’s built of concrete and sand and is the largest amphitheatre ever built. From the Colosseum, we walked to Il Vittoriano, built in the early twentieth century and honours Italy’s first king. Afterwards, we made our way to the Piazza di Spagna, at the bottom of the Spanish Steps. It’s one of the most famous squares in Rome and owes its name to the Palazzo di Spagna, seat of the Embassy of Spain among the Holy Sea. 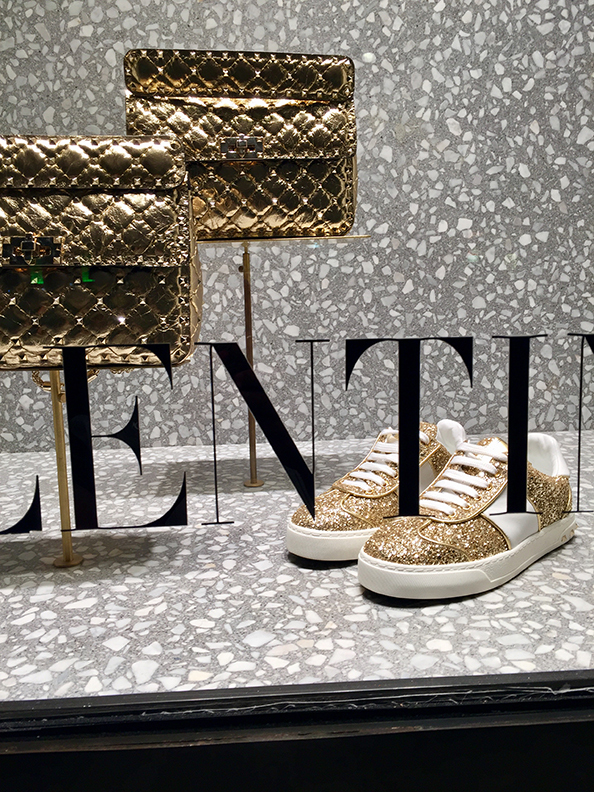 This is where I fell in love with these shoes and purse in the Valentino Store. No trip to Rome is complete without a visit to the Fontana di Trevi in the Quirinale district. The Trevi Fountain is known as one of the most stunning fountains in the world. 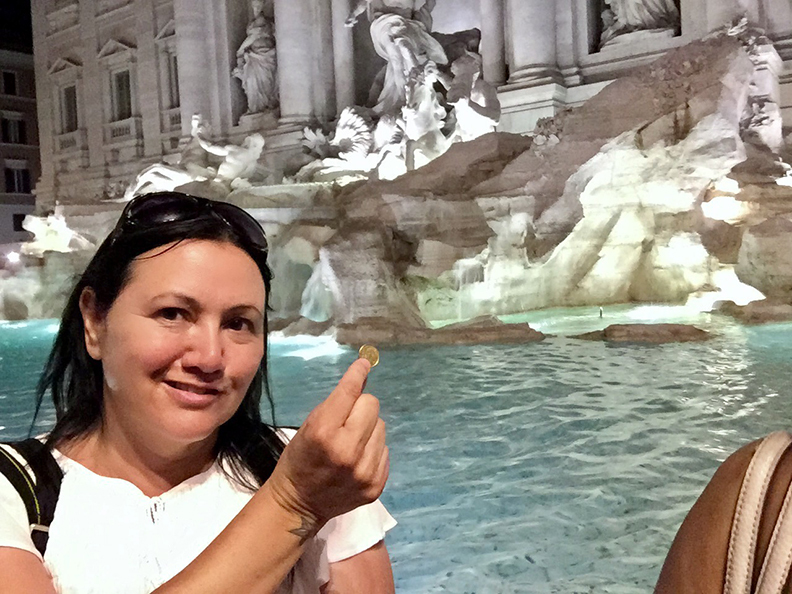 Throwing a coin from the right hand over the left shoulder will ensure that you will return to Rome in the future. This is my coin, hoping to return to Rome a third time. 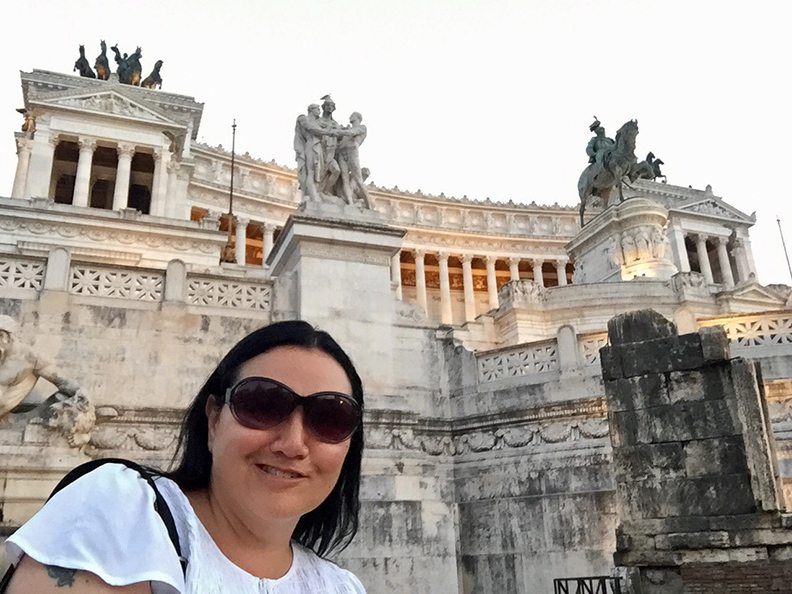 I spent half of the next day at the Vatican City. The Cappella Sistina (Sistine Chapel) serves as the pope’s private chapel. The pope who commissioned Michelangelo’s frescoes in 1508 was Julius II, the nephew of Sixtus IV. 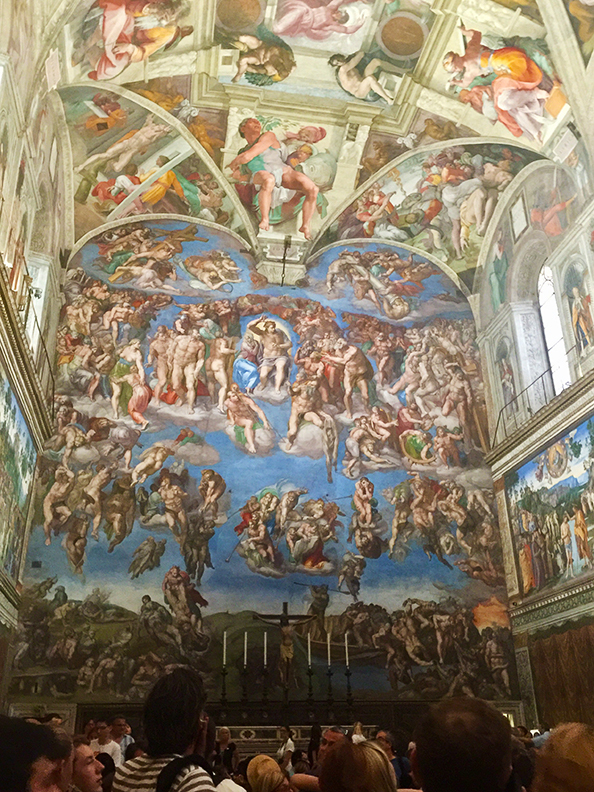 Contrary to myth, Michelangelo did not paint on his back, but on a platform of his own devising that extended over half the area of the chapel and allowed him to stand upright. It was moved midway through the project. At no point could Michelangelo look at the work in progress from below, but he was still able to paint images on a vast scale from a distance of a few inches. After leaving the Vatican, I saw these shoes and they were on sale so I bought them! I put them on and wore them for the rest of the day. 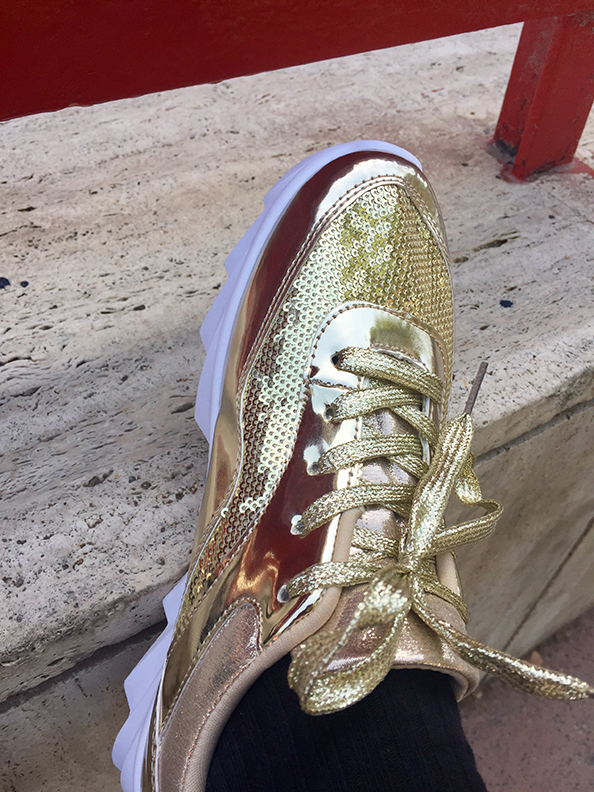 They’re not Valentino, but they got bling and I got them in Rome! Before leaving Rome there was one more artwork I had to see. “The Ecstasy of Saint Teresa” is the central sculptural group in white marble set in the Cornaro Chapel, Santa Maria della Vittoria. On my last visit to Rome, I did not get a chance to see her so I came today. 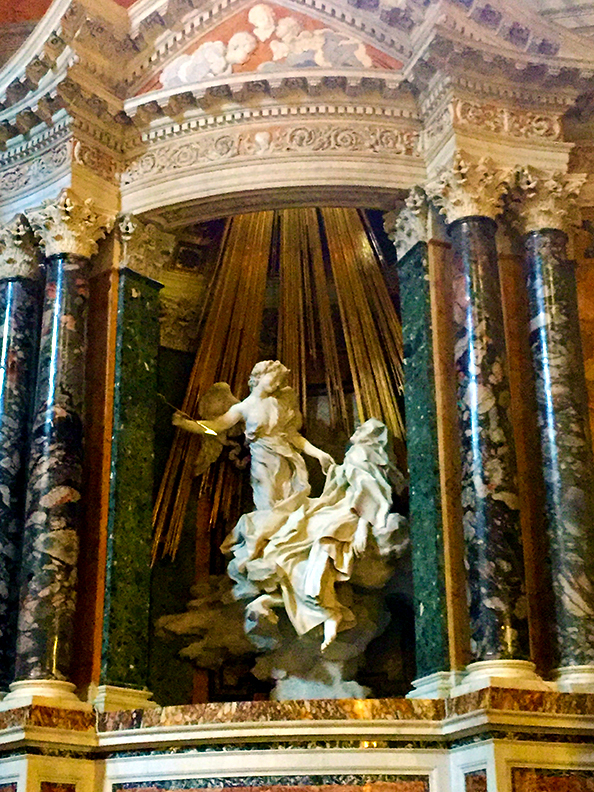 It was designed and completed by Gian Lorenzo Bernini, the leading sculptor of his day, who also designed the setting of the Chapel in marble. The church is beautiful and I am glad that I got to visit.